The failure of the bike share scheme in Brisbane led to calls to exempt it from the helmet law. The government response was to commission a study to defend its controversial legislation. Bureaucrats even edited the “study” in favor of the legislation. Such “research” should not be misrepresented as science. The failure of the bike share scheme in Brisbane led to calls to to exempt bike share from the helmet law. A document obtained under the Right to Information legislation (RTI) revealed that the government response was to commission as “study” to defend its controversial helmet law. CARRS-Q was only given 13 days, and paid $35,000 to produce a “study”. 13 days is too short to conduct high-quality research. Thus the “study” is mostly a re-hash of previous studies supporting helmets. the report was reviewed no fewer than three times by the State Government’s Transport and Main Roads Department before its public release, with some significant changes made to ‘strengthen’ the supposedly academic findings. Since when does academic research gets edited by the party commissioning it, in favor of its own agenda? The study press release is full of bold claims, lacking supporting evidence. It dismissed calls to exempt bike share from the helmet law, backing the government agenda. The government (surprise!) quoted this commissioned “study” to dismiss calls to review the helmet law. Such use of dubious studies is not new. Governments have commissioned many policy-driven studies since the failure of the helmet law became apparent. Using junk science is not new either among helmet fanatics, as shown in Canada, where various tricks and optimistic assumptions are used to push for a helmet law. In another strange example, a helmet fanatic claimed that bike share increased brain injuries when the data in the study showed a significant decrease in head injuries despite an increased number of cyclists. It is quite common for helmet “studies” conducted by helmet fanatics to make claims that are contradicted by their own data from the study. A close look at the study reveals wide discrepancies between its bold claims and the evidence. As would be expected from a report produced in a short time, and edited by the bureaucrats commissioning it, it is full of errors, invalid claims and unexplained discrepancies. There is no evidence backing up this statement. This indicates the amount of “research” conducted. Somehow the study ignores that cycling numbers could conservatively double if the helmet law was repealed. How this conclusion was reached is a mystery. The quoted source is another policy-driven study. It is difficult to see how such conclusion can be reached, even from the dubious data quoted. Perhaps it is one of the edits from the bureaucrats. Figure 2 on page 26 of the study reveals that cycling injuries increased after the helmet law, despite a lower number of cyclists. This is consistent with what has been observed in other states. In NSW, the injury rate tripled after the helmet law, due to a strong increase in accidents. This is hardly an indication of the success of the legislation. 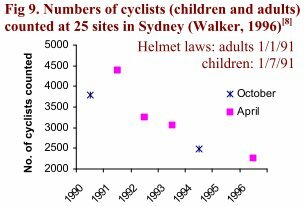 Yet that didn’t stop the study authors from claiming that the helmet law had been a success. A key claim from the study is that exempting bike share from the helmet law would result in increased head injuries. This is based on an old discredited “study” conducted by helmet lobbyists, that claimed that bicycle helmets protect against 85% of head injuries. Since, the researchers have disowned their claim. Why is it used as the foundation for this study then? The study ignores that helmets tend to increase the risk of accidents, DESPITE the fact that its own data indicates an increase in injuries after the helmet law. There are so many errors in this study, that would be too long to list. Some of them are described here, here, here, and here for example. Such claim contradicts the most relevant evidence available. The best evidence we have of what might happen if the helmet law was relaxed is the experience in the Northern Territory. NT relaxed its helmet law in 1994 and reduced its enforcement. Since then, the helmet wearing rate is the lowest in Australia, cyclist hospitalisations per capita are the lowest, and cycling to work is 3 times higher than the national average. The study makes prophetic claims about bike share, also contradicting the available evidence. In London, after 7 million trips, there were no fatalities and only 9 injuries requiring hospitalisation. The serious injury rate is 3 times lower than for all cyclists. Bike share is safer than walking. The helmet requirement is irrational. With its low speed and upright position, bike share is safer that walking. How can such a counterproductive policy have greater benefits than negative side-effects? The helmet law has failed to achieve its stated goal of reducing the cost of cycling injuries. Several government agencies have obfuscated this disappointing result through misrepresentation. The information below is an extract from CRAG submission to the Prime Minister in 2009. Following this submission, the federal government abandoned its policy of supporting compulsory bicycle helmets. Federal authorities’ commitment to compulsory wearing of bicycle helmets has never wavered since 1984 and excessive assurances of its value have continued. Although federal authorities knew of the deficiencies of helmets that Corner et al. had found, they pressed the states and territories to pass laws for compulsory wearing. The federal minister threatened to seek reimbursement of funds in the event of non-compliance and he dismissed his South Australian counterpart’s reservations, arguing that permanent brain injury would be prevented.,Federal authorities also criticised an exemption which the Northern Territory granted for adults on cycle paths,, but their main effort to uphold compulsory wearing was directed to Western Australia. Opposition to compulsory wearing of helmets was strongest far from Canberra, Western Australia being the last state to legislate, in 1992. Its Parliament’s Select Committee on Road Safety reviewed the application of the helmets law to adults in 1994. As this threatened the integrity of the national policy, the Federal Office of Road Safety made a submission which argued for upholding the law FORS’s argument on the effects of compulsory wearing on fatalities and injuries, and the fall in rates of usage of bicycles is examined here. FORS presented two graphs which purport to show the effect of compulsory wearing on bicycle fatalities. The first, Figure 1 (with data for 1994 and pedestrians added here), is misleading in not taking any account of the effect of the fall in usage. Separate listing of fatalities to children and adults, as in Table 1, together with data from surveys showing declines in cycling post-law , makes it possible to correct for both the effects of reduced usage and the general improvement in road safety. Source of data: FORS, 1997. Road Fatalities Australia: 1996 statistical summary. The fall in fatalities to all cyclists from 1989 to 1993 can be explained as being the product of improved road safety and declines in cycling of 40 per cent by children and perhaps 20 per cent by adults; it is not evidence that the helmet laws reduced the risk of death. FORS also claimed that the reductions in head injuries and fatalities are far greater than the decline in cycling, but this made no allowance for the general improvement in road safety; the claim is irrelevant. FORS stated that helmets have little or no effect on injuries other than to the head, but this discounted the possibility, well known at the time, that wearing one could change behaviour and the risk of accident. Decreases in head injury in some states were cited, but with no allowance for improved road safety or the declines in cycling. According to FORS, reduction in head injury is the best measure of compulsory wearing, but this highlighted its failure to understand the real problem, namely, how to protect from brain damage and consequent death or chronic disability, not from minor trauma. For Victoria, FORS noted that in the first year after helmets became compulsory, cyclists’ claims on the Transport Accident Commission (TAC) for head injuries decreased by 51 per cent compared to a fall of 24 per cent in non-head injuries. In the second year, the respective decreases were 70 per cent and 28 per cent. FORS said that Lane and McDermott (1993) ascribed the difference to increased helmet wearing. As the difference would seem to be unaffected by the general improvement in road safety or declines in cycling, it might appear to be persuasive evidence of the efficacy of helmets – until inquiries to the TAC revealed a similar trend for pedestrians. 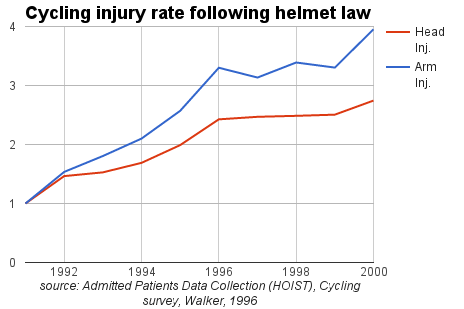 This is shown in Figure 2, the vertical line showing the start of the helmets law. Again, it would appear that the cause of the decline in the risk of head injury was changes in other conditions, not helmets. Source of data: Transport Accident Commission, pers. comm. 1.12.95. FORS discussed the fall in bicycle usage as shown by survey data from Victoria, NSW and Western Australia. For all three states, the declines in cycling that followed the helmet laws were underestimated and similar declines pre-law to post-law which had been measured in Queensland, the ACT and the Northern Territory were disregarded. FORS argued that reductions shown in surveys are not a proven result of helmet laws, which could only be found from much bigger surveys or over a longer time. “Unfortunately, long term data is not available”, it said, but it is government, not fortune, that was to blame for that. It was known in 1985 that cycling had declined when private schools compelled students to wear helmets, but FORS’s advice to its Minister on the compulsory helmets proposal did not mention this or the need for monitoring. FORS’s Monograph 19 (1997) makes three arguments. The first is that compulsory helmets resulted in serious casualties to cyclists declining by more (33 cent) than all road users (23 per cent), from the 4 years “prior to compulsory wearing” (1987-1990) to the 4 years after (1993-1996), but if 1989, the last year before any helmet laws, is compared with 1993, the first year when all were in force, the respective declines are 31 per cent and 25 per cent, much less different. FORS says use of a 4 year period allows evening out of random variations from year to year, but the argument is specious because the numbers in each year exceed 1000. (By contrast, FORS’s submission to the review of the law in Western Australia, discussed above, claimed a reduction in fatalities by using numbers of less than 200.) Also, it is wrong to include 1990 in the base period because the helmets law came into effect in Victoria mid-year. As casualties to all road users in 1990 were 13 per cent below 1989, those to cyclists being unchanged, this results in further over-statement of the difference in the declines in the two groups from pre- to post-law. Also, FORS disregards the decline in numbers of cyclists. Taking this into account, it is clear that cyclists became worse off compared to other road users . Second, FORS states that helmet wearing rates, as measured from casualty crashes, are negatively correlated with deaths and casualties to cyclists, but it provides no details of statistics or sources. The meaning of the claim is not clear and it is at odds with data on wearing rates of casualties . Third, FORS finds from pooled data for 1988, 1990, 1992 and 1994 from its Fatality File that known wearers of helmets suffered fewer severe head injuries on average than non-wearers. It concludes that the absence of a helmet significantly increased the number of severe injuries by up to 21 cent. It is not clear that the finding has any clinical importance, it not being shown that the number of head injuries was related to fatality, nor even stated that head injury was the cause of death, and the data are confused by a change in coding practice by which multiple injury to a single region of the body was coded as multiple in 1990 but under that region in 1992.Also, the data span a great increase in the wearing of helmets after compulsion, and a change in the standard. In 1988, hard shells were required, but from 1990 cyclists were able to wear soft helmets. A more apt description of FORS’s pooling of data is jumbling together and obscuring the important trends that are shown in Table 3 . Not as dangerous as it has been portrayed. According to this assessment and this summary, cycling is less dangerous that walking for the same distance traveled. In other words, cycling to the shops is less dangerous than walking to the shops. Statistically, one can expect a severe head injury from cycling once every 8,000 years of average cycling. What type of cycling might be dangerous? Sweeping statements such as “cycling is dangerous fail to distinguish between very different types of cycling. Yet cycling as a mode of transport is safe. With its low speed and upright position, bike share is safe. In London, after 7 million trips, there were no fatalities and only 9 injuries requiring hospitalisation. The serious injury rate is 3 times lower than for all cyclists. But they keep telling me that all cycling is dangerous! The myth that all cycling is dangerous comes from years of helmet promotion campaigns. Scaremongering tactics manipulate our fears to push helmets. How do you promote helmets for a safe activity? Make it look more dangerous than it really is. Misconception 1: Cycling is dangerous. … Melbourne newspaper The Age quoted an emergency physician who opined that riding a bicycle on Melbourne’s roads was “verging on suicide” – an almost hysterical assessment of the risk. …. The claim made in the fear mongering propaganda quoted above is particularly misleading, considering that cycling to the shops is safer than walking to the shops. Even though cycling is less dangerous than many comparable activities, it is portrayed as being particularly dangerous. A funny parody of this ad highlights how cycling is misrepresented as being far more dangerous than it really is. Are these risks high? One way to think about this is the number of trips for one death to happen: one car occupant dies every 10 million trips and one pedestrian or cyclist dies every seven million trips. …. “Research studies and data clearly show that, in the current environment, cycling benefits greatly outweigh its tiny risks. We know of no study that contradict this fact. Contrary to common belief, cycling is safer than many other activities. For those frustrated after dealing with uncompromising bureaucrats and politicians who refuse to acknowledge the damage they have caused, the field of economics can explain how such disasters can happen, and the built-in incentives that prevent corrective action. There is a strange discrepancy between economic and political decision making, that is eloquently explained in this presentation by economist Thomas Sowell. Politics is the art of the plausible …. Economics is the study of scarce resources that have alternative uses. The rationing of scarce resources is inevitable. A famous saying in economics is “there is no such thing as a free lunch“: you can’t expect results without allocating resources. Economics involves trade-offs between alternatives at its core. Politics is different. Politics tries to ignore the inherent constraints that economics must deal with. Instead it pretends that grand objectives can be achieved at no cost. Bold promises get votes. Politics is the art of the plausible. What politicians advocate doesn’t have to be possible, merely believable. Much legislation is not properly thought through, resulting in unintended consequences. Politicians love to talk about solutions, as if they had no associated costs. Yet there are no magic solutions, there are only trade-offs. You make something a little better at the expense of making something else worse. If resources are devoted to a particular issue, they can’t be spent dealing with other issues. Politics involve solutions, real or imaginary. The perspective of trade-offs is lacking. Alternatives are not explored objectively. The touted solution is put forward, typically by exaggerating its benefits and ignoring its side-effects. A solution needs a crisis. A crisis can be easily manufactured using creative statistics. A crisis does not mean that it is worse than many other undesirable issues facing society, or even that it is getting worse. It’s easy to call anything a crisis, exaggerate its negative aspects, then call for a solution without considering alternatives. A policy is put in place, supposedly to respond to the crisis. Despite its well-meaning intentions, it can result in harmful unintended consequences. Sometimes the situation becomes worse. The bureaucrats then call for more of the same policy, throwing more of other people’s money at the “crisis”. The cure for a failed policy is often more of the same. An insidious side-effect of a failed policy is to create a new set of bureaucrats and consultants who make a nice cushy living out of it. They are happy with the status quo, it works nicely for them. Even though cycling head injuries were not greater than pedestrians or motorists, the government, lobbied by misguided doctors, singled out cycling as being a “problem” requiring government intervention. At the time the legislation was introduced, cycling was rising, providing significant health benefits to society, while cycling injuries were falling. There was no “problem” to fix. The policy failed to achieve its objective. The unintended consequence was to reduce cycling and to increase the risk of injuries. Before the policy the “problem” was getting better. After the policy, it was getting worse. The bureaucrats response has been to call for more of the same policy. The bureaucrats have funded many “studies”, using creative statistics, to defend their policy. These studies may be worthless from a scientific point of view, but they are useful political propaganda, often quoted in media responses to justify the policy. There seems to be no shortage of academics willing to take easy money for policy-driven studies. The bureaucrats keep trying to justify their policy using a naive narrow point of view exagerating its benefits while ignoring its side-effects. They still use long discredited claims like “helmet protect against 85% of brain injuries“, even though helmets are more likely to aggravate brain injury. They ignore negative side-effects: the decline in cycling, or the increase in accidents and injuries. They still defend the helmet law based on its theoretical benefits while ignoring its actual results. They seem unable to distinguish between helmets and the helmet law. Even though helmets can protect in some circumstances, that doesn’t mean that forcing them on all cyclists is a good idea, any more than it would be for pedestrians. Proven measures to improve cycling safety have been well documented. Whoever drafted this “strategy” seem uneducated about those proven measures. Yet they suggest “educating” cyclists on the magic benefits of polystyrene helmets, while they continue to do nothing to address the core issue: the danger from motorists. That they are so blinkered and unimaginative to believe that more helmet promotion is the solution to cycling safety illustrates the abyss of their ideology. Economists bring a perspective that can be helpful to assess policy decisions. By taking a broader perspective, considering the full consequences of a law on society, and comparing it with alternatives, people can rationally assess whether its benefits are worth its costs. Other countries have chosen different approaches to cycling safety. The results speak for themselves. In Australia, the cyclist fatality rate is five times greater than in the Netherlands, while the serious injury rate is 22 TIMES greater. It’s not hard to figure out which policy works best, except if you are a bureaucrat who makes a nice cushy living out of the current status quo, or a politician who gains votes by pretending to “do something for safety” while most people have been fooled into believing that the current policy “save lives”. The injury rate has tripled since the helmet law. By increasing the risk of accidents, helmets have made cycling more dangerous. Wearing a helmet can make us feel safer. However feeling safe is different than being safe. A recent study reveals a steady increase in cycling injuries in New South Wales (NSW), Australia, after the helmet law. Between 1991 and 2000, cycling injuries increased sharply. A 1996 cycling survey in Sydney revealed that cycling counts were 48% below 1991. According to the census, cycling in Sydney further decreased between 1996 and 2001. 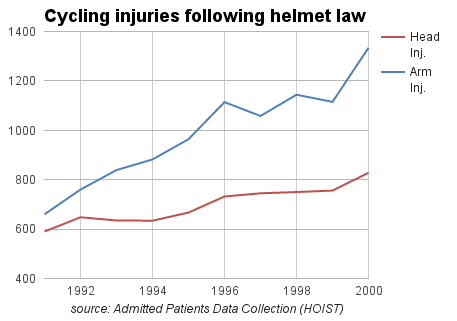 A decade after the helmet law, the injury rate tripled, indicating a large increase in accidents. Why did the injury rate triple? How can the widespread wearing of a device that protects the head result in almost a 3 time increase in the risk of head injury? There are several reasons for this unexpected result. A key factor for cycling safety is the number of cyclists. This is “safety in numbers”. The fewer cyclists, the more dangerous cycling becomes. The “safety in numbers” effect has been measured. The 48% decline in cycling observed corresponds to an increase in risk by 48%. Lured by a false sense of safety, helmeted cyclists take more risks and have more accidents. ”It didn’t cross my mind that this could happen,” said Philip, now 17. Both the behaviour of helmeted cyclists and surrounding motorists increase the risk of accidents. Cycling injuries have kept rising throughout the 1990’s. This coincided with helmet promotion campaigns exaggerating the benefits of helmets. This may have given cyclists a false sense of safety. Before the helmet law, Australia’s bicycle helmet standard required hard shells. 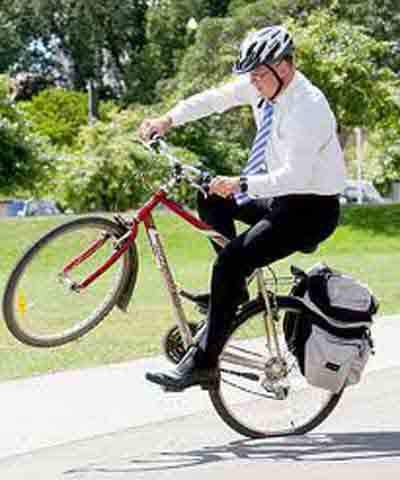 Government research warned of deficiencies in the standard, as helmets can increase brain injury. The research recommended improvement to the standard. Instead, the government degraded Australia’s helmet standard to accommodate ”soft-shell helmets”. Soft-shell helmets are more comfortable and facilitate compulsory helmet wearing. However they provide little protection and can cause brain injury. By degrading the helmet standard, the government legitimized a weaker helmet. Calling a polystyrene hat a “helmet” doesn’t give it protective abilities. Still, it can fool people into believing that it provides more protection than it does. This is likely to have contributed to the increase in head injuries after the helmet law. Following the helmet law, many cyclists who used a bicycle for transport gave up cycling. Transport cyclists have fewer injuries than sport cyclists. The increase in injuries after the helmet law can in part be explained by a reduction in transport cycling. However, the reduction in transport cycling cannot have quadrupled the injury rate. safety in numbers: the risk of accidents increased as there were fewer cyclists. risk compensation: helmeted cyclists lured into a false sense of safety, taking more risks. Degrading the helmet standard to include polystyrene “helmets” that provide little protection. The safer cyclists stopped cycling. But wait, the study claims the helmet law was a success! How can the study make such a claim? It ignored the decrease in cycling. It ignored the increase in injuries. Do they think we are complete fools? the government of NSW has commissioned research which (surprise!) finds the effect of their helmet law is massive and sustained. The authors … include all types of minor flesh wounds, bruising etc. which you would certainly hope would be prevented by helmet use, rather than looking at a reduction of critical injury / death which is what public health policy should be worrying about, when the alternative is serious sedentary disease. It’s generated some nice headlines and superficial reinforcement for the helmet law (which is probably what the government were really trying to commission).. Such taxpayer funded “study” helps the government cover up its mistake. How does that serve the public? The fundamental role of science is to serve the truth. It is NOT to serve the interests of the state. Contrast it to the original ad. A bicycle activist has created an amusing parody of a fearmongering ad commissioned by a government agency to promote bicycle helmets. The chance of getting a major brain injury while cycling gently to the shops is less than when crossing the street as a pedestrian. To tell cyclists they have been singled out to wear a helmet when their risk of head injury is lower than others makes no sense. It is suggested that wearing a helmet would prevent a severe brain injury. That is not true. Bicycle helmets are not capable of doing that. On the contrary, they are known to increase the risk of brain injury. It is ludicrous to use brain injury scare tactics to push people towards the “safety” of polystyrene helmets that are known to increase the risk of brain injury. Cycling is safer than netball. Bicycle helmets increase the risk of accidents and injury. The core message people retain from such ads is that “cycling is dangerous”. Helmet promotions like this one are known to scare people of cycling. This turns people away from a safe, gentle and healthy mode of transport. This “message” was commissioned by “road safety” bureaucrats who are very generous with taxpayer’s money to fund propaganda. How can it be money well spent to tell people that cycling is dangerous when other bureaucrats from the health department are spending taxpayer’s money to encourage cycling? It is our money they are wasting. HelmetFreedom has put together an analysis of this misleading ad. HelmetFreedom has also some sample letters you can use to write to your MP, so that we can put an end such waste of our money.